All of your ailments will quickly feel better with the funny band aids. Cover your scratches, scars, and boo boos with cute band aids! Replace all of the boring band aids with the adorable band aids that we offer! We have a large selection of unique band aids that will mend any boo boos you may have. Kids love them! I know when I get a boo boo, the first thing I think of is Monty Python. What? Does that make me weird? 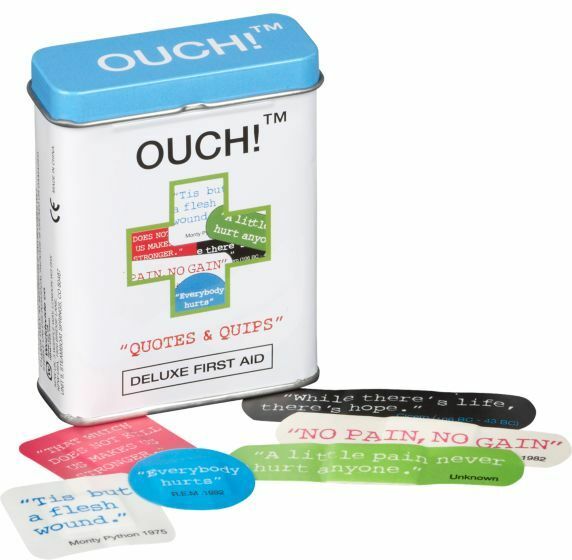 Next time you find yourself with a cut or bruise, cover it with one of the many sayings of the Quotes and Quips Band Aids. Popular quotes from classic philosophers and poets like Friedrich Nietsche and Jane Fonda. Dude, Jane Fonda is a modern day Socrates...with really good abs. When the pain starts flowing from that scraped knee, just put on a Quotes and Quips Band Aid and remember I'm not dead yet! 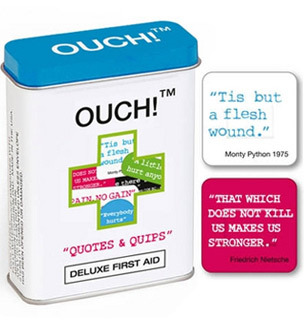 Quotes and Quipes from Ouch!